congress-parody in a five-star resort in Rhodes. The actual role of the leadership of GSEE (Greece's General Confederation of Labour) has been fully exposed during recent events, about which you can read in the following articles: 1. Workers storm, interrupt event of the reformist Greek General Confederation of Labour (GSEE) and 2. PAME's George Perros denounces the trade union mafia of the GSEE leadership. On Thursday, a new incident that took place in the island of Rhodes, confirms the dirty role of the GSEE bureaucrats as "stooges" of the employers. 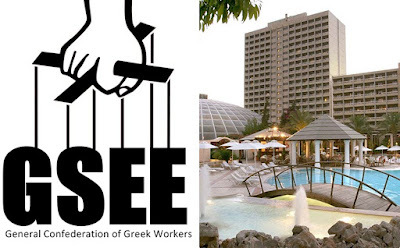 After the fiasco in Kalamata - where the class oriented forces of PAME and labour centers cancelled the fiesta of GSEE - the leadership of the trade union mafia decided to organize its "Congress" at a luxurious resort in Rhodes. Once again, they tried to deceive the working class by organizing a parody of Congress with illegitimate delegates and employers instead of workers' representatives! The leadership of Panagopoulos, Kioutsoukis, Theoharis and their collaborators of employer's trade unionism tried, once again, create a false correlation of forces (employers delegates instead of workers) in order to keep the trade unions tied to the desires and interests of the capitalists. Unfortunately for them, the class-oriented movement was in Rhodes in order to prevent the Congress-parody. In the early morning of Thursday, hundreds of workers, including members of the All-Workers Militant Front (PAME), entered the hotel and lamented the reformist leadership of the GSEE, shouting slogans and demanded the exclusion of employers and fake delegates from the workers' congress. Following the incident, the leadership of the GSEE unleashed a hideous, anti-communist attack against PAME and the Communist Party of Greece (KKE) in the mass media. They falsely accussed the members of PAME for "violence", while there are videos where its clearly shown that GSEE security goons have attacked workers affiliated with PAME. Video from the intervention of workers in the hotel. In a statement, PAME states among other things: "Like thieves, 600 kilometres far from Athens and in five-star hotel-fortress which opened only for the election of the employers and monkey-delegates, the trade union mafia, alongside dozens of security goons was behind locked doors in order to organize a "Coza Nostra"-style congress". It remains unclear whether or not the parody of a congress, organized by the GSEE, will continue.